Thinking inside the box has never been easier, or more long-lasting! Fight fading and extend the life of your shade with these at-home coloring tips from our expert colorists. Finding the perfect hair color is like finding a diamond in the rough, or a needle in a haystack, or a pig that can… you get it. It’s tough stuff! That’s why once you’ve found it, it’s important to know the insider tricks to keeping your new shade from suddenly fading. Keep your hue looking freshly done and vibrant with some (or all) of these simple strategies. 01 Use permanent hair color. For color that’s meant to last, the word ‘permanent’ pretty much sums it up. It opens up the hair shaft and embeds dye deep within it, completely changing the color of your hair. The color will start to fade and grow out usually around seven to eight weeks for most people, but never entirely goes away. Demi-permanent hair color deposits color around the hair shaft. It changes the tone of the hair, and is an excellent way to play with subtle changes in color with more of a commitment-free result (it’ll last for about 24 shampoos). See our full article on demi-permanent vs permanent hair color for more. Figuring out how frequently you want to color, and staying on top of it, is a good way to avoid hot roots. Be sure to refresh your roots when regrowth is around an inch long, to help ensure an even color and to prevent something called “banding” - overlapping (or extending) new root color down over old color. This may make your hair appear darker than color solely applied to new hair growth, creating a “band” of a lighter color at your roots. For hassle-free delivery, get your custom color autoshipped where you want it, when you want it. 03 Apply a deep conditioner. Healthy hair is happy hair. And happy hair likes to hug your color - it holds onto it better than dry, damaged hair. “Think of the hair shaft as a pinecone, with layers surrounding the shaft to protect it. Healthy hair has those layers smoothed down and flat so hair feels soft and looks shiny. 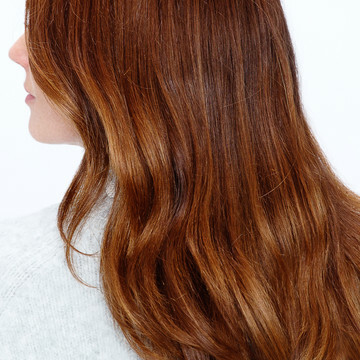 But, when hair is dry or damaged, the layers lift away from the shaft, creating a rough texture,” says eSalon colorist Emily M. To impart moisture and shine, use a deep conditioner. Work the product into clean, wet hair, paying extra attention to dry ends, and leave it on for eight to ten minutes; then rinse out. Hair feeling particularly parched? Our pros recommend leaving it on for up to 20 minutes. Up the ante by applying it, then wrapping your hair in a warm towel or shower cap for an hour or two before rinsing! Never thought you’d hear anyone say that, huh? But, yep, we’re going there—because shampooing daily can strip hair of its natural oils and dislodge color molecules which fade your shade. Aim to shampoo every other day, and slash wash time by using our Cream CoWash, a shampoo and conditioner built into one product, which safeguards hair’s natural oils, boosts shine, and protects hair color. If you work up a sweat at the gym on a daily basis, use a dry shampoo post-workout to absorb sweat, oil, and stinky odors—without fading color. Just like your skin requires a little TLC, so does your hair color. 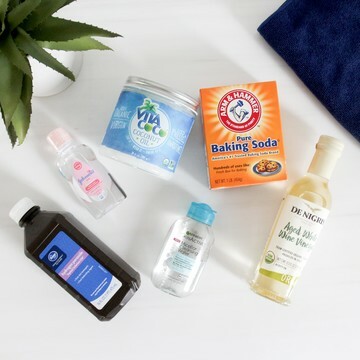 Many shampoos contain sulfates, which are heavy-duty cleansing agents that make hair super clean, but tend to remove color molecules and moisture along with dirt. So, opt for sulfate-free products specifically made for color-treated hair. Water, sun exposure, and frequent styling with hot tools can make hair color fade faster. Keep it on lockdown with a pigmented treatment that revitalizes your shade in-between applications. For color that gets brassy, use a neutralizer that counteracts unwanted warmth. To kick up neutral or warm shades, like reds, you can use a color enhancing treatment that adds vibrancy, especially on the ends where color fades most. Our secret weapon, Tint Rinse comes in 12 shades so there’s an option that’s going to fit your exact color. Our color pros recommend using it twice a week—or as often as needed. When grays start to sprout between color applications, do a quickie cover up. The type of temporary root concealing product you choose depends on your hair type, and the amount of grays you have: Those with fine hair should go for a root concealer spray—it softly dispenses pigment, and creates the illusion of thickness without weighing hair down. Coarser hair benefits from heavier coverage; choose Temporary Root Touch-Up, which is applied to the hair with a tiny, wand brush. You wouldn’t leave the house without applying sunscreen on your face, right? Well, your hair’s no different. For everyday, use a Leave-In Conditioner that shields color from damaging UV rays and prevents it from fading. 09 Turn down the heat. High temps open up the hair cuticle, letting color sneak out—so take lukewarm showers and try to limit the use of heat tools like blow-dryers, flat irons and curling irons. They also may dry out and damage hair, and hair color can’t deposit evenly on fried, broken strands. Spritz a thermal hair protecting product onto towel-dried hair before using any tools. Blunt, freshly trimmed ends ensure color looks even from root to tip. Color has a hard time adhering to layered, damaged, or split ends. So, get a trim every three to five weeks if your hair is short—or at least every 12 weeks if you have a long style. Now that you know these 10 easy tricks for keeping your hair color looking vibrant, we see nothing but gorgeous hair color days ahead. How Do I Remove Hair Color from My Skin, Countertops, Floors, and Clothes?